Trying their hand at a compatriot’s fun and games are Lausanne’s ensemBle baBel, a resilient five-piece improvising group, largely schooled at the same city’s Conservatoire, and flying their national colours at full-mast on this tribute to the world’s favourite New York-via-Geneva sound art conceptualist, Christian Marclay. 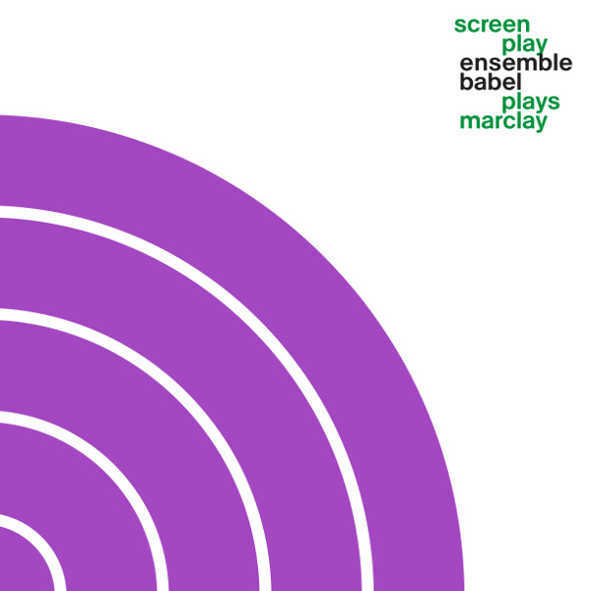 In something of a variant of his colleague John Zorn’s game pieces of the ‘70s and ‘80s, noted vinyl-splicer Marclay developed a number of image-based prompting systems from the mid-‘90s onwards, which ensemBle baBel has latched onto with an uber-patriotic fervour, to the point of ensuring that even the LP sleeve follows ‘the tradition of Swiss graphic design’, as they proudly note. Which is far from saying that Mr Marclay is undeserving of the attention – I sense that the fun and childlike spontaneity he brings to the often dreary tenements of the avant garde are worthier of attention than the many more-of-the-same installations Brian Eno is deemed fit to be commissioned. Not that these particular recordings sound especially original nor whimsical when removed from their visual context, but divested of the fly-on-the-wall’s vantage point, the listener can take comfort in the fact that the Marclay cannot be covered – certainly not in the sweat of a lesser act’s well-meaning homage – only played with a sense of continual discovery. The fittingly titled ‘Screen Play’ (2002) spans a full LP and lends itself to multiple readings, both that of veiled recreation and, more literally, that of Marclay’s ‘silent movie serving as a real time graphic score’ where improvisors follow and soundtrack the 30-minute video collage of split-screen videos overlaid with coloured lines and sharp edits; a kinetic, colliding score full of crashing waves, handstands and suchlike – playful visual koan stimulating a surprisingly cohesive, collective response from the players, who ooze and congeal as a single extra-terrestrial agglomeration with stray remnants of jazz instruments protruding from its pink, suppurating hide; occasional hints of percussive definition swiftly slinking back to the first state of beautiful (dis)grace. However many times baBel have rehearsed this act, this single rendition proceeds with an edge-of-seat sense of purpose that belies any familiarity. I suppose that if only one version of this film exists, it would likely have to pass through the grinder a fair few times to engender complacency in the ranks. Besides, the group has other games to play in the meantime. ‘Graffiti Composition’ (1996-2002) and ‘Shuffle’ (2007) introduce and induce similar strategies: the former a set of responses to photos of poster-sized scores that had been hung around, weathered in and scrawled on by Berlin denizens in 1996. Thus essentially an anonymous composition and initially driven by dour, harmonic exchanges between electric guitar and double bass, it does attract all hands and builds a (severed) head of steam in due course. This forlorn foray could possibly be taken for a portrait of pre-unification East Germany, where the odd jazz motif peeps cautiously around cold, concrete corners. To stretch the metaphor: served in three separate ‘takes’, this puzzling piece’s back-to-square-one format openly exhibits the risks of being caught in the open. Taking us further into the unfamiliar, ‘Shuffle’ plays with a similar deck – quite literally in this case, the deck in question containing 75 card-sized photos of tangentially musical ‘partitions’ for musicians to respond to in a similar wise to heretofore i.e. without recourse to familiar musical syntax. Thus, keening and irascible peals of sax and guitar provide a shaky surface for subsequent shenanigans, as well as modelling the miniature mode of each of these seven rounds, where a prompter changes the cards at regular intervals to uproot (I imagine) the players from whatever furrow they’ve dug themselves into. Greater stridency might be noted in these more abortive efforts, which may send more cotton-wool listeners screaming back to the womb of ‘Screen Play’ for renewed comfort. Potential fun for all concerned in other words, and while not sounding like nothing we’ve ever heard before, the group shows sufficient variation in tack between one game piece and the next that it’s a good deal easier on the ear than a full sitting of Zorn’s Parachute Years. Given their apparent gusto for visual cues, I wonder what ensemBle baBel might make (or have made) of Cornelius Cardew’s Graphic Scores, were they not dead set for the time being on Keeping It Swiss.